The offshore wind industry has seen its global levelized costs of electricity plummet 22% due to competitive bidding, reaching a benchmark estimate of $126/MWh during the second half of this year, according to new figures from Bloomberg New Energy Finance. 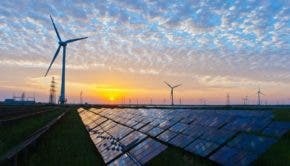 In its latest study of the levelized cost of electricity (LCOE) for all renewable and fossil fuel generating technologies, Bloomberg New Energy Finance (BNEF) pointed to competitive bidding auctions in the Netherlands and Denmark for helping to drive down the costs in offshore wind, pushing the benchmark (or weighted average) estimate for offshore wind globally down to $126/MWh in the second half of 2016 — down 22% from the first half of 2016, and down 28% from the second half of 2015. BNEF points to two specific auctions which took place earlier this year. The first, announced in July, saw DONG Energy win the contract to develop the Borssele 1 and 2 Offshore Wind Farms off the coast of the Netherlands, both coming in at 350 MW for a total of 700 MW. DONG Energy won the contract at a cost of €72.70 per MWh over the first 15 years of the contract — after which, the two wind farms will receive the market price. The second auction, which was awarded in September, went to Vattenfall, who placed the lowest bid for the Danish Near Shore Wind Tender for two offshore wind projects located in the Danish North Sea, for a final bid of 0,475 kr/kWh (€60/$67.33). However, high cost projects being developed in deep UK waters are responsible for the higher benchmark cost — though it is still well down on previous figures. The BNEF report also found that other technologies are seeing continued declines in their LCOEs. Onshore wind’s global benchmark estimate is $68/MWh, 16% below the first half of the year, making it well and truly cost competitive with coal and gas-fired generation in many countries. The LCOE for crystalline-silicon solar photovoltaic projects reaching financial close in H2 2016 is $100/MWh.